About White Shark Diving Co.
White Shark Diving Company is more than just a diving company – we are deeply committed to conservation. We are one of just 8 cage diving operators based in Gansbaai – the ‘Great White Shark Capital of the World’. 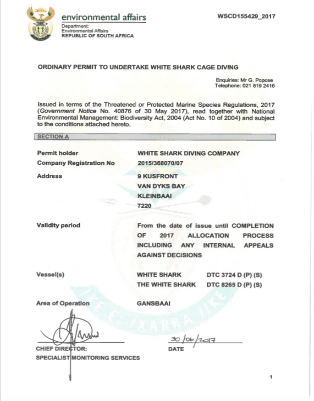 White Shark Diving Company is a founding member of the Great White Protection Foundation and has been a leading voice in the call for operators to collaborate in protecting the dwindling number of sharks and other marine species off the coastline of South Africa. A crucial part of our initiative is to educate local and international visitors about the conservation plight of the great white shark. We run daily trips to educate guests about great white sharks and our current conservation initiatives. Our cage diving trips give visitors the opportunity to see great white sharks in their natural environment, where their grace and beauty is most evident. White Shark Diving Company is fully committed to the preservation of great white sharks and our marine environment as a whole. This is reflected in our various conservation and social responsibility initiatives, including our volunteer programme. We have shark sightings throughout the year, however, please bear in mind that sightings of wild animals can never be guaranteed. In the unfortunate event that you do not have shark sightings during your trip, we do not offer refunds but we will provide you with a non-transferable voucher (valid for two years) allowing you to join us for another trip free of charge on a date of your choice (dependent on availability). To qualify for a shark dive permit, which is issued by the South African Government’s Department of Nature Conservation, an operator has to comply with a strict set of rules and a code of ethics. The permit is renewed on an annual basis. Sea worthiness of the boat, qualifications of the crew, standard of facilities, equipment and cages are all qualifying factors. Vessels and equipment are subject to an annual inspection by Government Officials. The White Shark Diving Company operates in a responsible and eco-friendly manner, our staff and crew are well-trained individuals, and our facilities are upgraded on a continuous basis to ensure continued growth through customer satisfaction. White Shark is a 12 meter long sea-cabin cruiser Cat It has been custom built to the specifications required in the shark cage diving industry. She is the most recent boat built in the shark cage diving industry with the most modern design and requirements installed. Engines: The new 4-stroke outboard – with 4.0 liter displacement, a 24-valve V6 powerhead with dual overhead Suzuki, offers more speed, more acceleration and more performance than any outboard ever made. It’s the world’s strongest cams, with variable valve timing, and a new streamlined lower unit that slices through water like a hot knife through butter. There has never been so much power in an outboard. However the real reason White Shark Diving Co uses these outboards is due to the eco friendly nature of their emissions. The ultra low emissions can hardly be noticed. In fact you can hardly notice the engines when switched on.